Mohamud Ege grew up in the heat and dust of northern Somalia, the son of a family of nomads who were kept constantly on the move by the need to find water and grazing for the camels and sheep which were their only possessions. When Mohamud was five, his father was killed by a snake. A wise uncle then suggested that Mohamud, alone of his family, should go to school – a rare privilege in their culture. To attend school, Mohamud had to sleep on a rush mat, survive for long periods on nothing but pancakes and do his homework by moonlight. 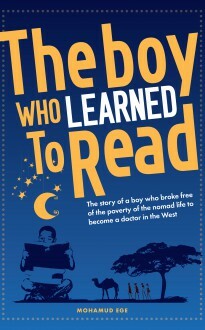 The hardships did not prevent him from discovering the joy of reading books and developing a keen appetite for learning. By the time he was in his teens he was determined to break free of the poverty of the nomad life and become a doctor in the West. Thanks to hard work and help from his friends he managed to qualify as one of Somalia’s first doctors, but he had to battle the strife and unrest of his native land, as well as prejudice and red tape from those in authority, for more than twenty years before he finally managed to qualify as a doctor in the UK. This is his story.